You know those businesses that immediately make you feel welcome? The ones that really care about you and your first meeting with them feels like you're getting a drink with friends? That's how we like to make our clients feel and those are the types of businesses we love. On our blog we're going to start highlighting those special businesses. Businesses that we know you can trust because we do. First up is Taylor Jones Photography. No one would believe it now, but when I was a kid, I was painfully shy. I stuttered and wore hot pink glasses with confetti in them, and my affinity for oversized 90's Hanson Brothers t-shirts also made me painfully awkward. When I was twelve I got my first camera and was immediately fulfilled with a creative outlet for my awkward self. I got so much joy taking photos of others and seeing their reaction when they saw themselves through my eyes. From that point on, I always had a camera on hand. It wasn't until college that I started taking my photography to a career level and I decided upon graduation from West Virginia University, to pack up my Corolla, Phoebe, and move to Colorado to pursue my dream of being a Rocky Mountain Wedding photographer. I tried working other jobs in unrelated industries and quickly realized again and again, that my true passion was in photography and business and it was going to take me dedicating all of my time and energy into creating a career. I thrive off of weddings, couples, love and have a true passion for capturing the love two people share. One night, my husband, boyfriend at the time, and I were sitting around our campfire while camping and we started chatting about our future. He knew I wasn't fulfilled in the job I was in and encouraged me to quit and fully chase my dream of photography and start pursuing the business side of things. I was terrified but also incredibly overwhelmed with excitement. Quitting a job and losing a steady income/health insurance was almost too much to bear, but I knew there was nothing I wanted more than to be able to dedicated 110% of my time and energy to couples, photography, weddings, and my business. 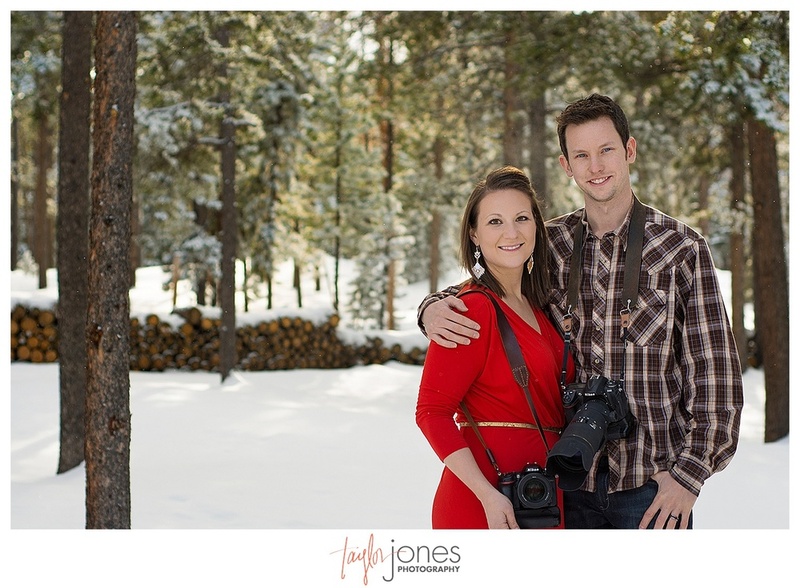 If it wasn't for my husband, I may have never had the courage turn my love and passion for photography into an incredibly fulfilling career and business. Honest to goodness, my favorite part of my job is the relationship building I get to do everyday with our couples. My husband, Mike, and I shoot together and we have committed ourselves to developing relationships with our couples before their wedding day. We love knowing who we're working with, little quirks about them and that they love about each other, and really building a level of trust and friendship. I feel so fulfilled in my career and that could never be replaced by any other job I could have possibly pursued. We spend the best day of most people's lives with them and their closest family and friends, so we take it very seriously to have a relationship with them going into the wedding. Mike always tells me that my strengths are my deep rooted relational skills, making people laugh, and making people comfortable in front of the camera. Let's face it, being at a photo shoot is the single most awkward experience outside of middle school for a person to go through. I've spent countless hours creating ways to make couples comfortable and relaxed with us, which goes back to that relationship building I'm so adamant about! I find Mike's strengths to be that he's an amazing listener, he has an incredible mind and thinks creatively, and he's the hardest working man I've ever met, and never gets tired...ever. Our ideal client is the couple who truly understands and respects the sanctity of marriage. We love a good wedding as much as the next person, but a wedding is only as good as the bride and groom and the relationship foundation their building on. Anyone can throw a big party and wear a pretty dress, but it's those couples who cherish their relationships and the have the utmost respect for the commitment they are making to each other that we strive to work with. We love to work with couples who genuinely want to be married, understand the vows they promise to each other, and are living to make the other person happy in their marriage. We love our career as wedding photographers, but our passions and morals lay in marriage, love, and respect. I get inspired by people and the mountains. I'm undoubtedly an extrovert and thrive off of other people, their passions, and their individuality. The mountains are where Mike and I both feel most at peace and at home. So, give us an awesome couple in the beautiful Rocky Mountains and watch out people! This photographer duo is going to be unstoppable! What's your favorite thing about Colorado? Hands down, my favorite thing about Colorado is the mountains. Sometimes I have to pinch myself. During our peak summer and fall season we'll occasionally shoot 2-3 weddings every weekend in the beautiful Rocky Mountains and I find it so hard to believe that I'm living my dream of living and working in the mountains. Most people don't take vacations to the mountains as much as we go there to work and I feel so blessed to have the opportunity to do what I love with people I love on a daily basis. I'm not just living my dream, I'm thriving off of it and am in the thick of it. When I started telling friends and family in West Virginia I was moving to Colorado to start my wedding photography business, they always asked, "Oh, do you ski/snowboard?" I'd reply with a laugh, a "no", and explained that I was moving to Colorado for the mountains. I truly believe there is no more humbling feeling than being amongst the mountains. It's where I feel at peace, where my faith flourishes, and where I realize how small me and my problems are. Anything we missed that you'd like to add? Mike and I were married in September 2014 and work together as a team on the photography. We live in the mountains with our two pups (Mason and Copper), our two chickies, two baby goats (Darcy and Delilah), and our horse Timber. We will spend every opportunity we can camping and hiking in the mountains and can't wait to own a ranch one day!